While the state has publicly reported much of the information for years, the new-and-improved report cards offer parents a central hub to explore key data behind their children's schools. 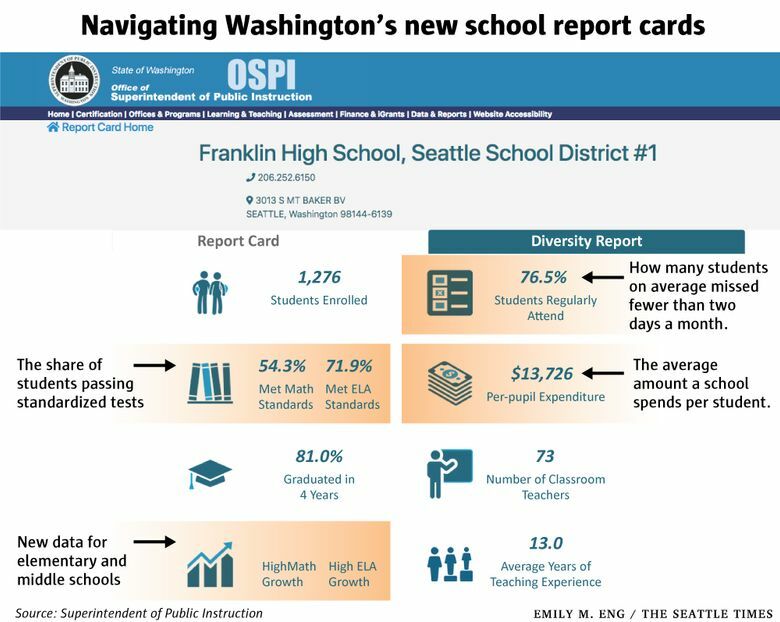 Late last year, Washington state released new school report cards online for parents and guardians to see how well their children’s schools performed. The Office of the Superintendent of Public Instruction stabilized its servers sometime after the new year, putting the state in line with new transparency rules under the federal Every Student Succeeds Act. But, similar to the rollout of redesigned report cards in other states, family advocates in Washington quickly wondered whether parents could navigate the layers of data reported for their neighborhood schools. That convinced Education Lab to share exactly how to explore, and make sense of, the newly overhauled report cards. Katie Weaver Randall, the state’s director of student information, oversaw the redesign and noted the new report cards work better on mobile devices. For non-English-speaking families, they can be translated using Google. While some family advocates questioned the reliability of that translation service, Weaver Randall noted the state agency would work with school districts and partner groups to spread the word of the new report cards. “We know that we are not reaching families in communities most impacted by disparities in our schools as effectively as we could, and we often rely on our partners to help us with that,” she said. Parents and guardians can find the new report cards at washingtonstatereportcard.ospi.k12.wa.us. After searching for a specific school, the next page provides a snapshot of basic figures, such as total enrollment, the number of classroom teachers and how many students passed standardized tests in math and English language arts. The main report card also includes regular student attendance, an indicator of school quality that measures how many students, on average, missed fewer than two days a month. For high schools, it tracks on-time graduation rates. New information in this section includes an estimate from the state on how much money each school spends per student and the average years of experience for teachers. And for elementary and middle schools, parents can see — beyond basic proficiency rates — what percentage of students posted high levels of growth in math and English language arts. Just below the fast facts section, parents can take a deeper dive into the data behind their child’s school. 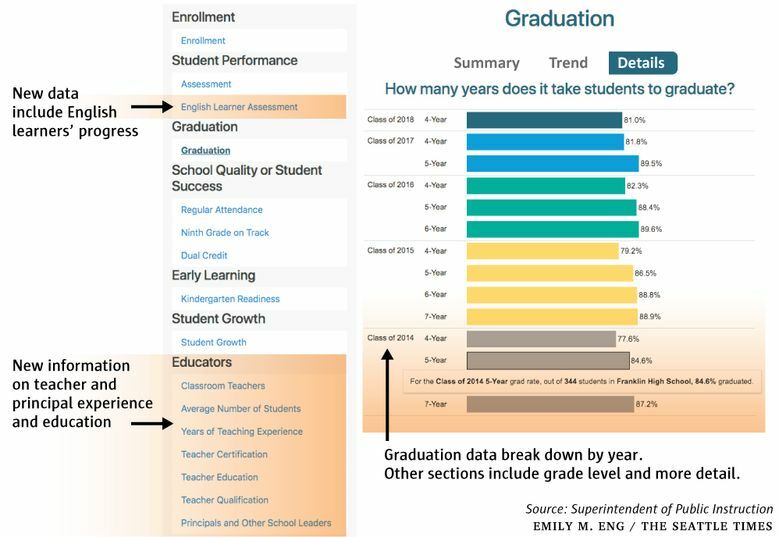 The state has publicly reported much of this information for years, but the revised report cards offer a central hub to explore trends and details in eight categories: enrollment, student performance, graduation, school quality or student success, early learning, student growth, educators and finance. “The data is presented in simpler, more easily understood data visualizations,” Weaver Randall said. The educator category provides the bulk of the new data, including class-size ratios and how many inexperienced teachers and principals work at each school. The redesigned report cards also now show how much progress English learners have made in their new language, and what percentage of ninth-graders passed all their courses — a strong predictor of how many freshmen will graduate in four years. The finance category for the first time breaks down how much money each school and district spends per student on major costs, such as salaries, administration, instruction and transportation. At the top of the page, parents can toggle between the main “Report Card” tab and a “Diversity Report” tab. The latter section offers new data that reveal how the averages from the main report card often mask the reality for different groups of students. The state’s overall graduation rate, for example, reached 80.9 percent last year, up from 77.2 percent in 2014. 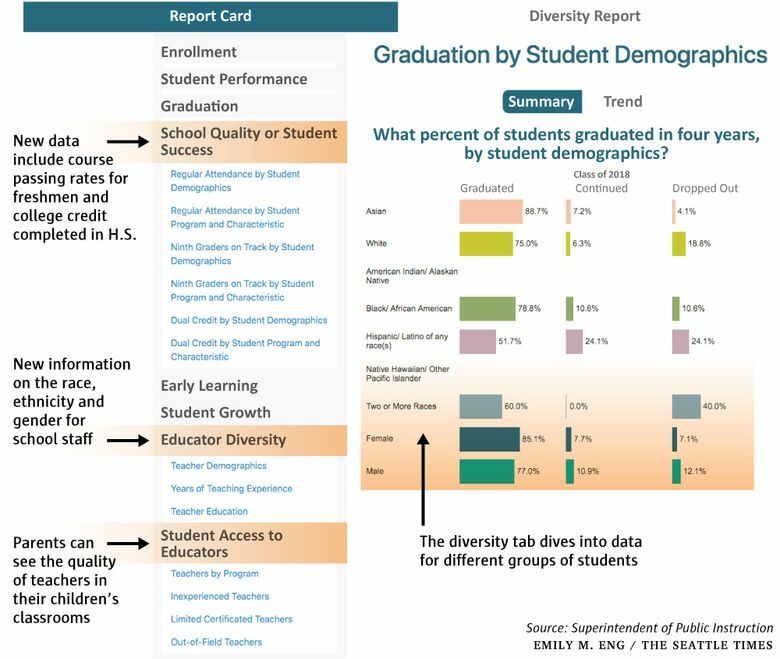 But not all students graduate at the same rate: The diversity tab shows wide disparities for students of color, students with disabilities, homeless students and students living in poverty. “Although there are still gaps between the graduation rates of different groups of students, those gaps are closing,” state schools chief Chris Reykdal said in a statement. Parents can explore whether similar gaps appear at their schools in the eight categories from the main report card. Reykdal, however, cautioned anyone using the new report cards against drawing firm conclusions from the data.